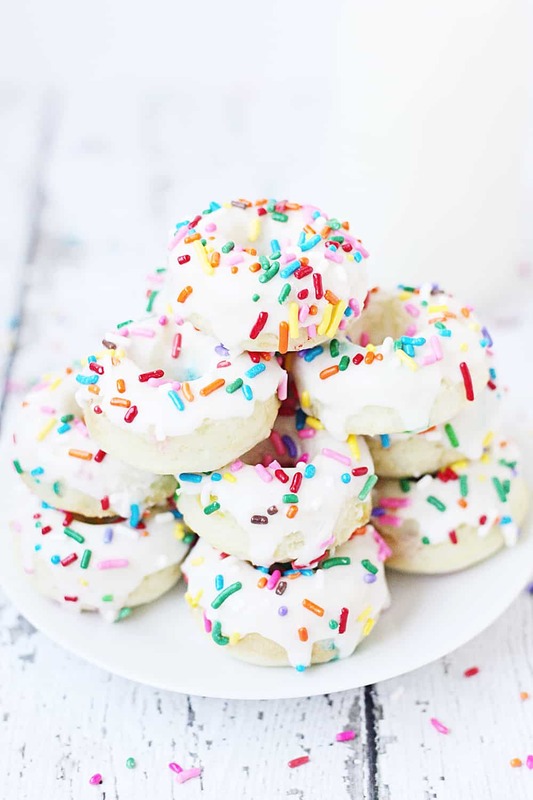 Mini funfetti cake mix donuts are the perfect party treat! 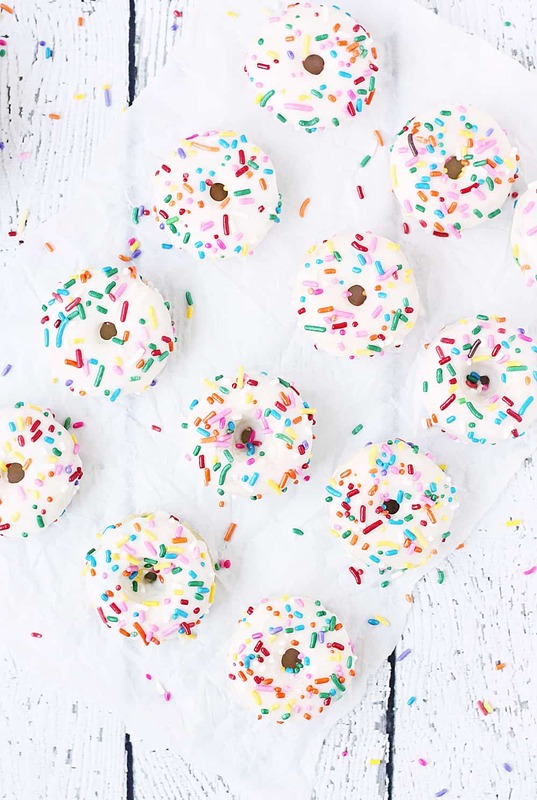 Topped with a vanilla glaze and colorful sprinkles, these mini donuts from cake mix are not only super cute but also super easy! 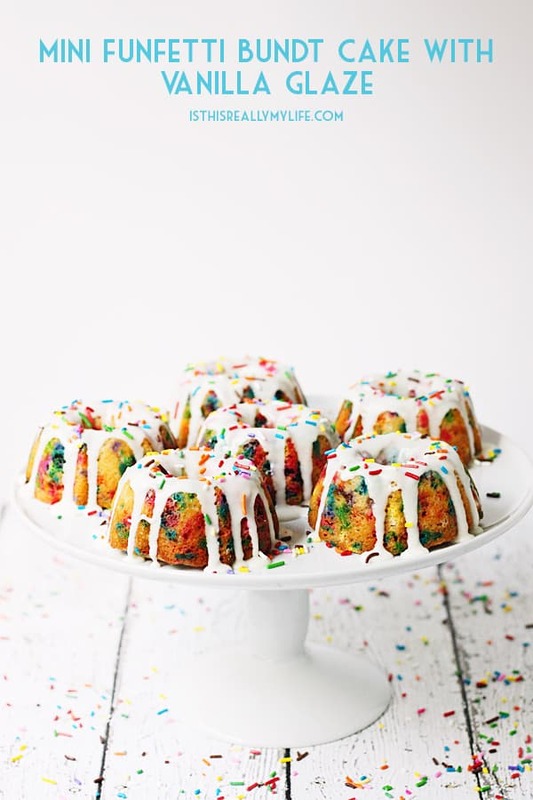 I can’t believe it was nearly a year ago I shared the recipe for those amazing mini funfetti bundt cakes. 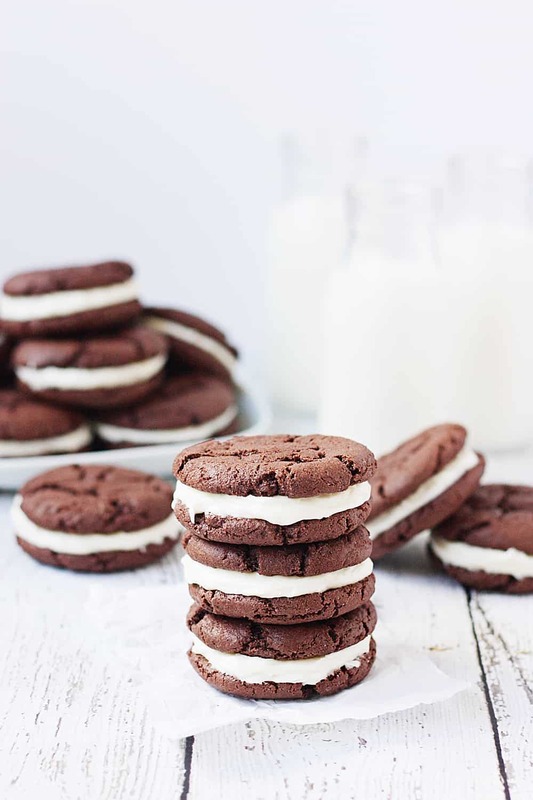 Why is it mini desserts taste so much better than their regular-sized counterparts? While I’ve made funfetti cakes from scratch, I much prefer doctored funfetti cake mix because it takes fewer ingredients and far less time. 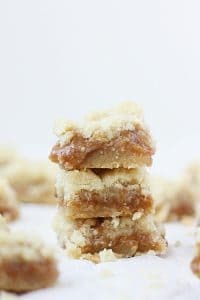 In fact, some of my yummiest desserts are easy cake mix recipes like this cake mix coffee cake, cake mix Oreo cookies, and oatmeal raisin cake mix muffins. 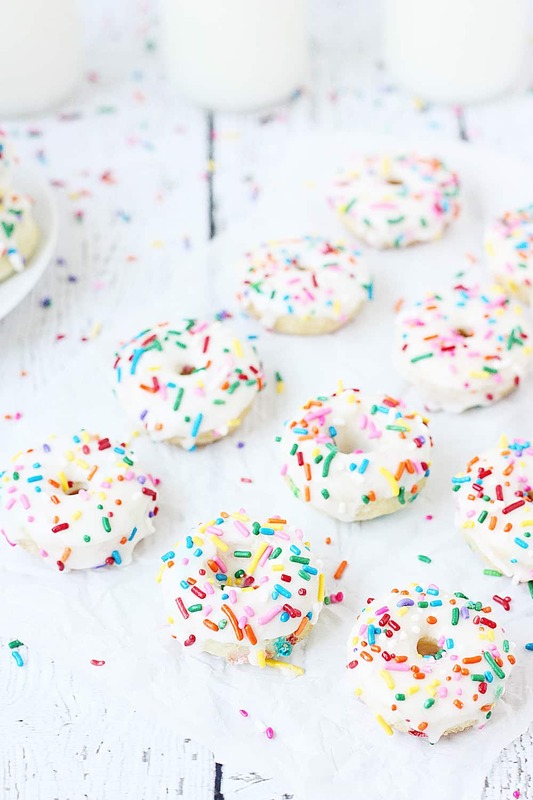 And while we’re at it, I’m pretty sure donuts using cake mix taste just as good as donuts not using cake mix. 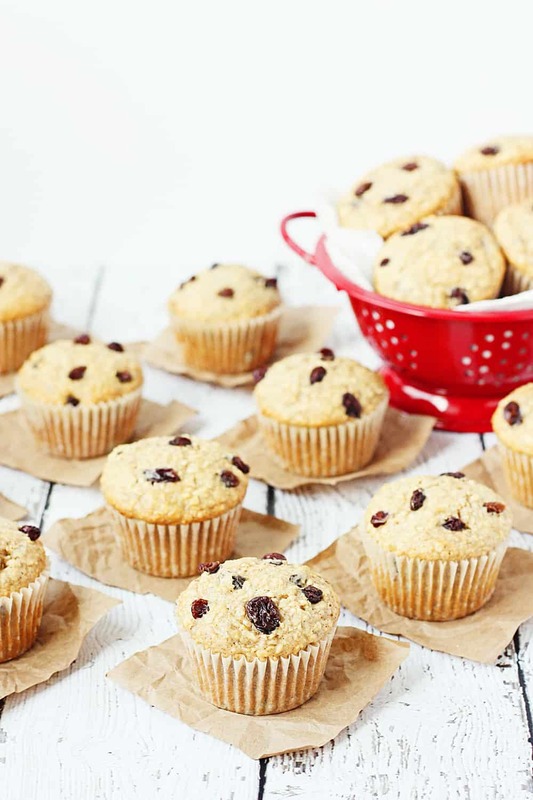 Or at least close enough to make the decision to bake ’em this way pretty dang easy. Another reason I love making anything funfetti is because funfetti desserts photograph so well. 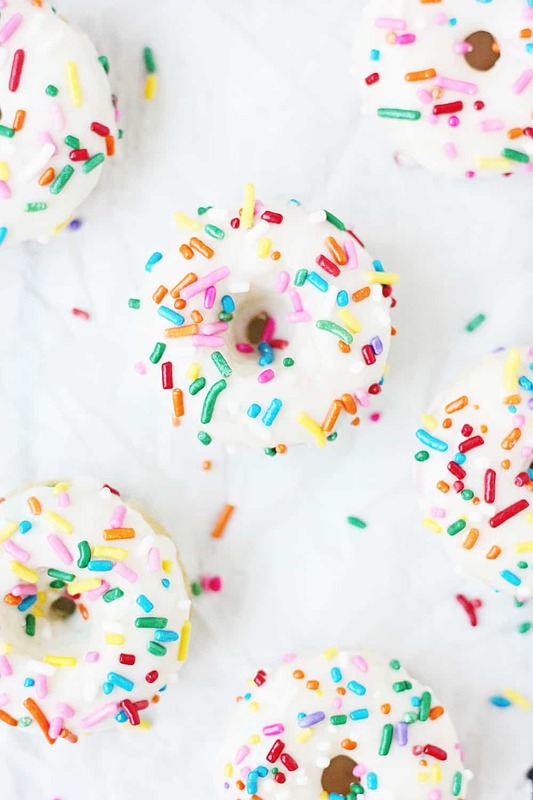 How can they not with all those pretty colors and playful sprinkles? 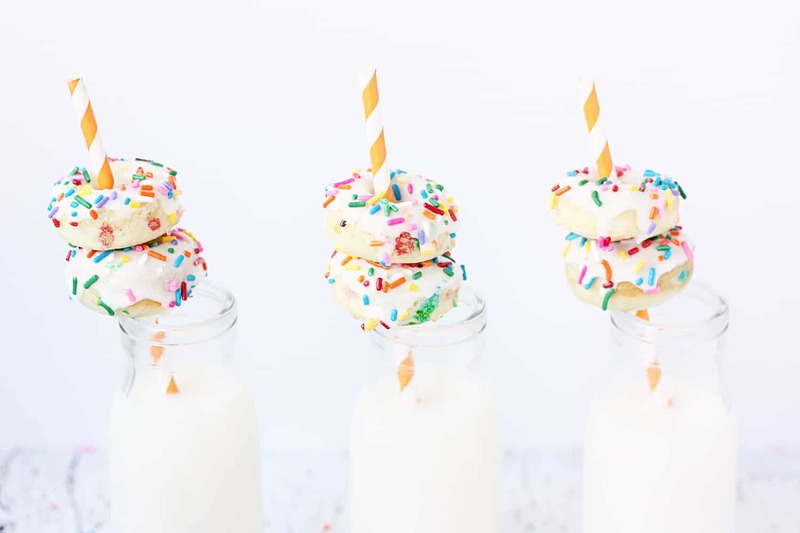 It’s happiness in a dessert, that’s what funfetti is. And I’m happy to serve it all the days. 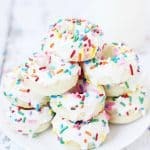 These mini funfetti cake mix donuts with vanilla glaze require only four ingredients for the donuts and about as many for the glaze. The secret to successful mini baked donuts is a quality donut pan. And some patience because the batter for these baked donuts using cake mix makes about four dozen mini donuts! I love this set of Wilton donut pans for regular donuts and this Norpro mini donut pan for these babies. 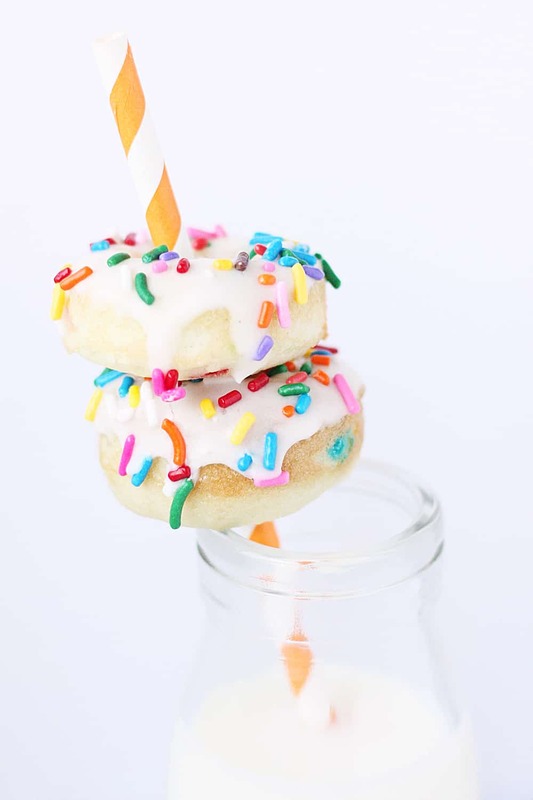 The nice thing about the vanilla glaze is it sets after a few minutes so you can gently stack the mini baked donuts if you need to transport them… or put them on plates to give to the neighbors. Sidenote, my kids are really tired of me giving away 98 percent of the desserts I bake. 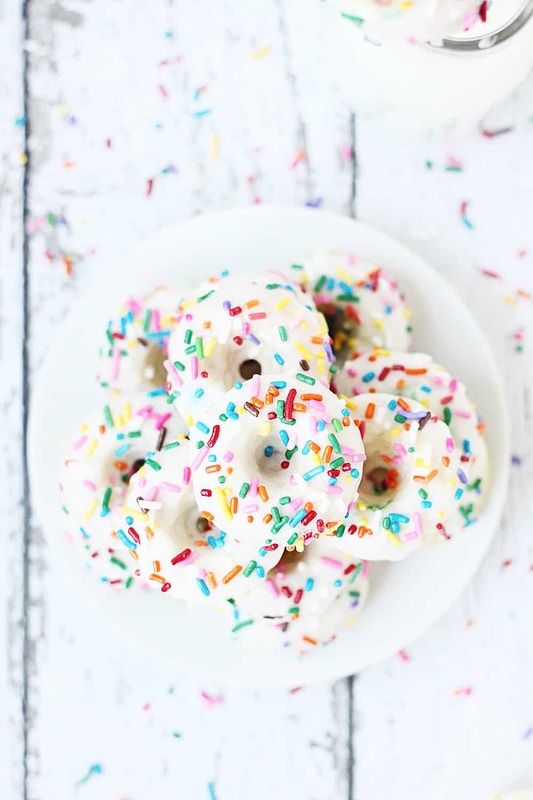 These mini funfetti cake mix donuts were no exception, but there’s no way I could keep 48 mini baked donuts around and not eat 32 1/2 of them. Just sayin’. Preheat oven to 350 degrees. Spray mini donut pan with cooking spray; set aside. 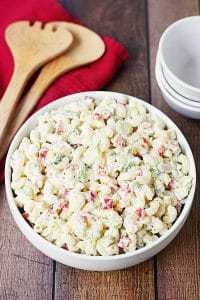 Whisk together funfetti cake mix, egg, water, and oil in a medium bowl until thoroughly combined. 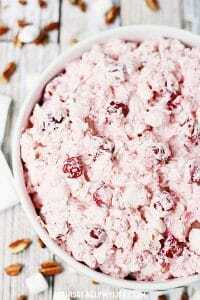 Pour batter into a gallon-size Ziploc bag and seal. Snip off a tiny piece from one corner. Pipe batter into donut pan filling no more than 1/2 full. Bake 12 to 14 minutes or until donuts are set. Cool 5 minutes in pan before removing to a cooling rack. Cool completely before adding glaze. Combine melted butter, powdered sugar, milk, vanilla extract, and sea salt in a medium bowl. 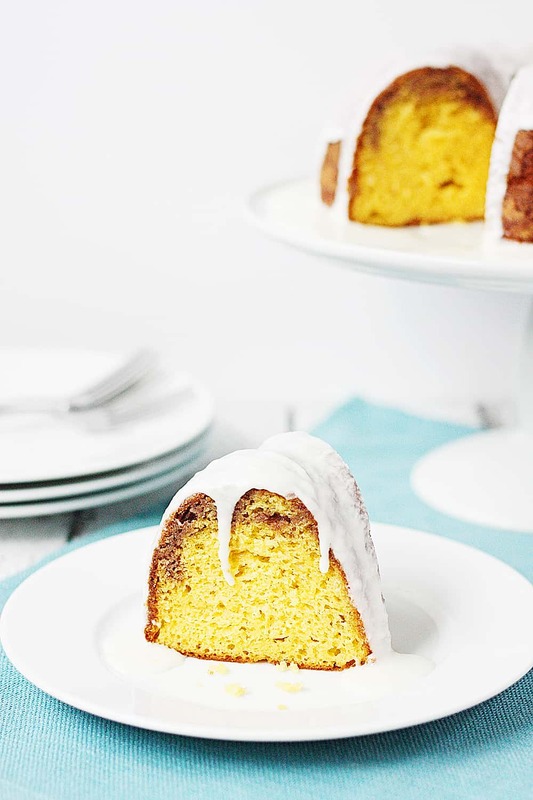 Whisk until no lumps remain, adding more milk or powdered sugar until glaze reaches desired consistency. Dip cooled mini donuts halfway in glaze. Flip over and place on cooling rack. 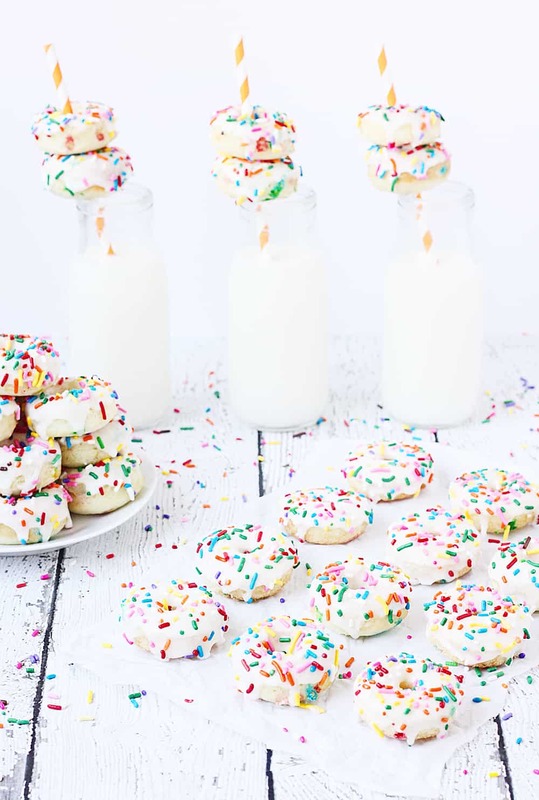 Sprinkle with rainbow jimmies or your favorite sprinkles. how long would you bake using the regular size donut pan? 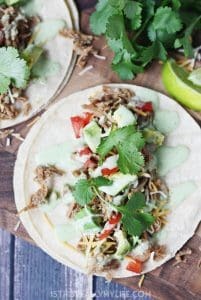 I haven’t made this in a regular-size pan but I bet you could find a similar recipe and see how long they baked it for. I imagine it would take a couple minutes longer.